2. 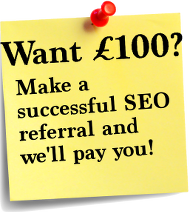 The referrer will earn a £100 in cash, payable by bank transfer, Paypal or cheque once the customer being referred has signed up to one of our SEO packages, paid in full and has been receiving our services for 1 month. For example, if the referred customer starts receiving our services on the 1st of June 2014, you could expect payment in July 2014. 4. If an individual or business has already been referred to us once, we will not make multiple payments. The first person to have made the referral of that individual or business will be the one that we pay. 6. If the new customer cancels our SEO services within the first month, no payment will be made to the referrer. 7. To qualify for the £100 payment, the new customer must be able to confirm the full name of the referrer. 8. Referrers must be able to supply sufficient payment details to make the payment possible or no payment will be made. 9. It is the referrer’s responsibility to provide a valid email address, contact details and payment details. 10. It is the referrer’s responsibility to contact InFocusSEO to claim their money. 11. Customers can only be referred to InFocusSEO once. In the event that a customer is referred to InFocusSEO more than once by the same referrer and/or by other referrers, only the first referrer will be eligible for a referral money under this scheme. InFocusSEO reserves the right of judgement and all decisions are final..
12. InfocusSEO reserves the right to withdraw or amend any offer, at any time, without notice.